Today, Prof. Noboru Sasao and Prof. Motohiko Yoshimura from Okayama University visited the Vienna group and gave a talk on an approach to measure neutrino rest masses using the isomer transition in Th-229. Discussions on future collaborations, as well as labtours at the Atominstitut, filled the day. 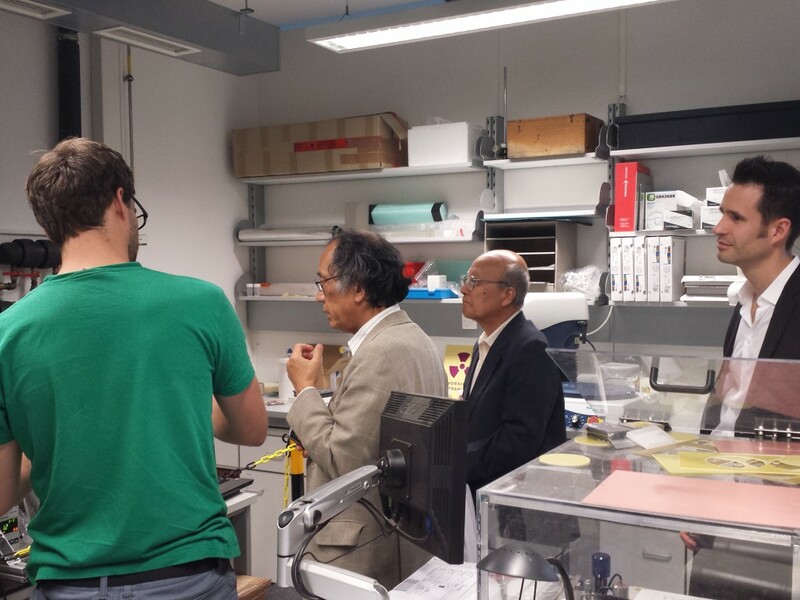 Discussing details of the crystal growing procedure: Matthias Schreitl, Noburo Sasao, Motohiko Yoshimura, and Thorsten Schumm (from left to right). Knowing the wavelength of the Th-229 isomer transition is utterly important, as it determines which schemes for a nuclear clock will work, and which ones will not. This value, however, is not yet known precisely, and it is one of the first aims of nuClock to determine the transition wavelength. To add some fun to the search, we are introducing TIB, the Thorium Isomer Bet. Here’s how it works: Make a guess of what the transition wavelength λ is, and quantify how certain you are about your bet (Δλ). Towards the end of the nuClock project, we will determine the actual value λ0 and its uncertainty Δλ0, based on latest measurements. Whoever came closest to the actual value will be invited to the final nuClock meeting, held in June 2019 in Vienna, and receive a mighty jéroboam (3-liter) bottle of champagne! To join the game, send your values of λ and Δλ (in nanometers) to Simon. Everyone (expert or not, within or outside of nuClock) is invited, bets are accepted until the end of this year. For the experts: Each bet will be modelled as a laser of wavelength λ, linewidth Δλ, and unit intensity, and we will calculate how many Th nuclei each laser can excite, using the Lorentzian-type expression for off-resonant excitation. Largest number N wins! Ekkehard Peik and Maxim Okhapkin published a new review article on the unique low-energy two-level system in the nucleus of Th-229. This up-to-date review paper describes all past and present approaches to find the isomer transition and outlines possible schemes for a future optical clock. The article “Nuclear clocks based on resonant excitation of gamma-transitions” has been published in a special issue entitled “The measurement of time” in the French series of books Comptes Rendus Physique, edited by Christophe Salomon.